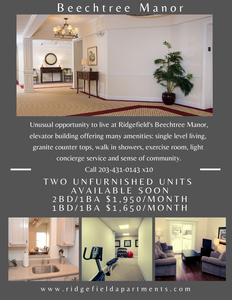 Ridgefield Apartments announces two opportunities to live at Ridgefield's Beechtree Manor, an upscale elevator building with a host of amenities including single level living, granite counter tops, walk-in showers, and exercise room and light concierge service. There are two unfurnished units are available SOON. For questions and to lease one of these beautiful apartments, call 203-431-0143 x10.